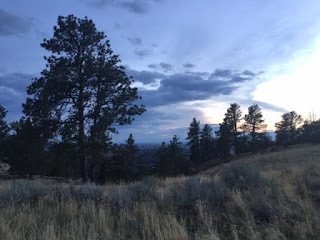 Run Which Way: Summer's last will and testament, Some great food and What's next? Summer's last will and testament, Some great food and What's next? Spring and summer are my favorite time of year. I love autumn weather as well, but because it portends the coming of winter I can't help buy dread it. Here in my neck of the woods, summer is fading fast and the blustery, slightly chilly weather of fall is here. The leaves are changing and finding their way to the ground. I do have a few things that I love and I look forward to - perfect running weather is among them. But I'm in no hurry for it. 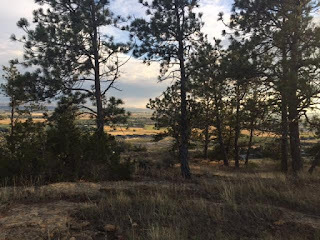 On Wednesday, I went for a trail run on the rims while Mitch rode his mountain bike. The weather was nice and starting at 6:30 p.m. there was still significant light out. I love taking pictures on the rims. 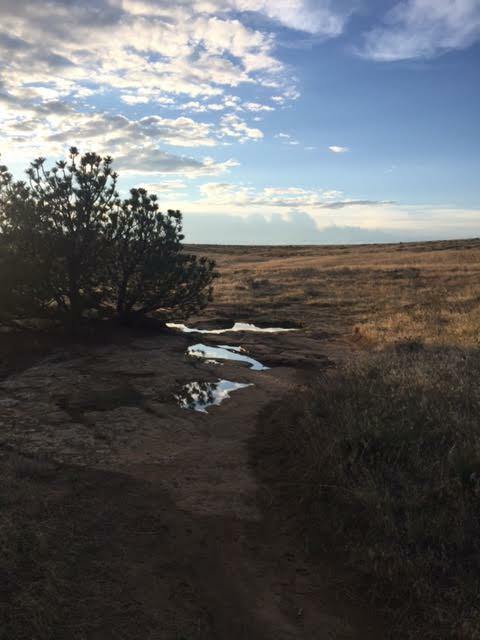 It rained a bit on Monday so there were puddles along the trail. I love running in the rain and missed my chance this week since I was sick. I took advantage of these beauties and splashed around in my trail shoes. My run lasted about an hour. It's amazing how quickly the sun was disappearing. Shorter days = sad Angie. I splurged on myself and bought this new cookbook by Shalane Flanagan and Elyse Kopecky. Shalane is an elite marathoner/runner whom I admire very much. I love this cookbook. Since I don't enjoy cooking and I'm not a fan of following recipes, that's saying a lot. I've made 6 or 7 recipes from it already. Shalane and Elyse promote what they call "Indulgent Nourishment." It's okay to include real fats in your diet, including butter, whole milk dairy and meat that isn't necessarily lean. It's a concept that I'm having a little trouble trusting, but I'm going to give it a try. Super hero muffins are the bomb. 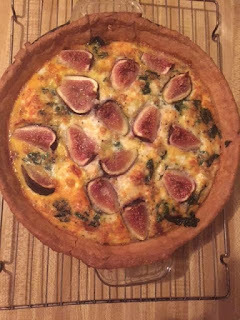 I can make a batch of 12 and they make for snacks/breakfast all week. 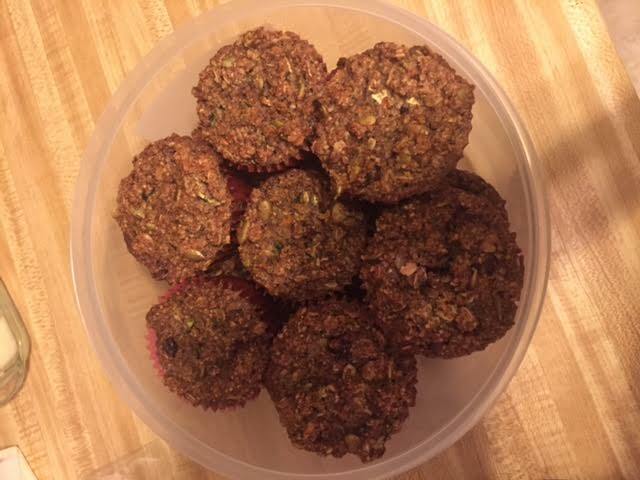 These aren't mini-muffins either. Fig and Pig Quiche - my first quiche ever and it was amazing. It was even better the next day as breakfast. Seriously... go get yourself a copy of this book! You don't have to be a runner to love it. 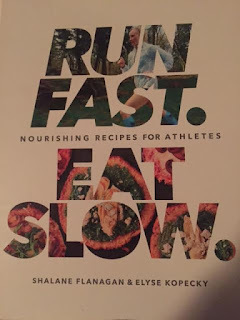 I bought mine at Amazon, but you can order direct from their website at Run Fast, Eat Slow. Some of you might ask, "What's next?" Well, most immediately is the Montana Marathon. Mitch is running the half marathon and I am volunteering at the aid station that my company sponsors. It's always hard to sit out at a race, but I like to think of it as my opportunity to give back to the running community. Volunteers are the heart and sole (look! a pun!) of my sport. I'll get the early shift so I can make it to the finish line in time to watch Mitch cross it. I'm super excited!! In October, Mitch and I are riding bicycles in an event through Yellowstone National Park. It's a 60 mile ride from West Yellowstone to Old Faithful and back. I'm nowhere near prepared for it. Cycling isn't my favorite. If it has wheels, I can crash and that makes me afraid of it. I'm less concerned about the distance (though I'm sure my nether region will pay) and more intent on teaching myself to ride downhill without creeping down at 2 mph on my brakes the whole way. I don't have a running race on my schedule yet until June when we will do the Yellowstone Half Marathon one more year. I'm pretty sure I will sign up for Turkey Run (Thanksgiving) and Run to the Pub (March), but I haven't really laid out my plan for next season. I know that I want to run two marathons and work all year on speeding up. But deep down I'm struggling with the fact that my big, holy cow race this year (The Rut) didn't go as planned. I didn't get my 50K and I didn't get to summit the peak. I finished and I worked hard to get through it and in no way do I feel like it wasn't a worthy accomplishment. But... well... you know.... unfinished business and all. But the big push for this year is definitely speed on top of endurance. I want that Boston Qualifier! I skipped the gym and opted for a 3.5 mile run outside this morning. Get it while you can, right? It was dark when I left the house so I got some use out of that spendy headlamp! 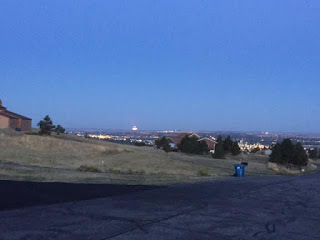 When I hit the top of my hill I witness the largest full moon set I can ever recall seeing. I took this lame picture with my iPhone 6. You can see the moon setting. It's my proof that I really saw it even if I can't possibly demonstrate how incredible it was. After work was packet pickup for Mitch for his race on Sunday. Then this happened. 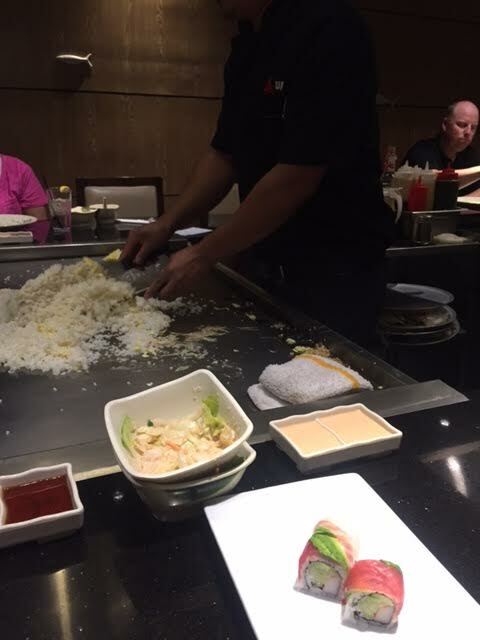 Sushi and Hibachi grill. It was delicious and I'm still so full that I wish I had a deflate valve. On that note, I will leave you with something I gleaned from a running podcast: Discipline trumps Motivation. This sums up a comment made by Jason Fitzgerald on the Trail Runner Nation podcast. Discipline will get you out of bed for your work out even if motivation fails to do so. Its food for thought and I think I should put that little mantra on my bathroom mirror to remind me that good habits and discipline to stick with a training plan is an important foundation. Motivation is awesome, but it is often elusive. Do you eat sushi? Real sushi or just California rolls? Any podcast listeners out there? What do you recommend?